Our VIP friend told Olivier that it was Winnie the Chew's birthday (conveniently ignoring that we were also belatedly celebrating his), so Olivier very generously sent us Champagne. The Gosset Brut Grande Réserve was a little pungent, chalky, and dusty. Perhaps it was a problem with the glass? Slightly high acidity on the finish. As usual we started with a series of nibbles, and I was glad that these were different from the ones I tried out in January. French spicy chorizo "La Maison Louis Ospital"
French saucisson sausage "La Maison Louis Ospital"
Croquette with eggplant caviar and smoked eel - the eggplant caviar inside was pretty nice... and I think the smoked eel was just the little piece on the outside. French oysters Gillardeau No. 2, granité vodka lemon - I think the "granité" had frozen into little pieces of ice when we got the oysters. Nice acidity here, and worked well with my favorite oyster. Grilled tuna with 5 spices, avocado crush and crispy shallot - one of Olivier's signature dishes here, and our VIP friend kinda said that it's served to him every time he comes. And why not?! It's a beautiful dish, with the acidity from the ponzu doing a nice job balancing the rich creaminess of the avocado, while adding depth to the tuna along with the soy sauce. And what about those crunchy deep-fried shallots and the garlic? Yum. Burgundy escargots with pumpkin velouté, Mimolette emulsion - the old man at the table complained about his soup not being hot enough, but I didn't mind... whether it's considered soup or sauce. The escargots were very tasty, and the staff shaved what looked like summer truffle on top. Really enjoyable. Abalone in the shell, sauerkraut and horseradish foam - a very tasty dish, and one inspired by the Alsatian classic choucroute. I had another version of this earlier this year, but this has since been refined and the bacon/lardon substituted with smoked haddock. You've got nice acidity from the sauerkraut to balance out what might have been heavier seasoning here. Very nice. And of course with more truffle on top. Sea urchin served in the shell, arborio rice risotto - another beautiful dish. Risotto cooked with tomatoes so the acidity helps balance the richness and the sweetness of the sea urchin... along with fresh herbs like parsley and tarragon to add a little extra to the dish. Surprises with a spicy kick. The dessert was ladyfinger with chocolate and fruit layers, vanilla cream, topped with yogurt sorbet. Not bad. I realized that at our January dinner here, I was pretty stingy and didn't bring enough wine, so I figured I'd better lug two magnums to dinner! 2000 Les Plantiers du Haut-Brion en magnum - nose was a little closed at first, but later opened up to reveal a sweet and caramelized nose, albeit a little dusty. Drank well but the characters of a fresh, young semillon have long faded. 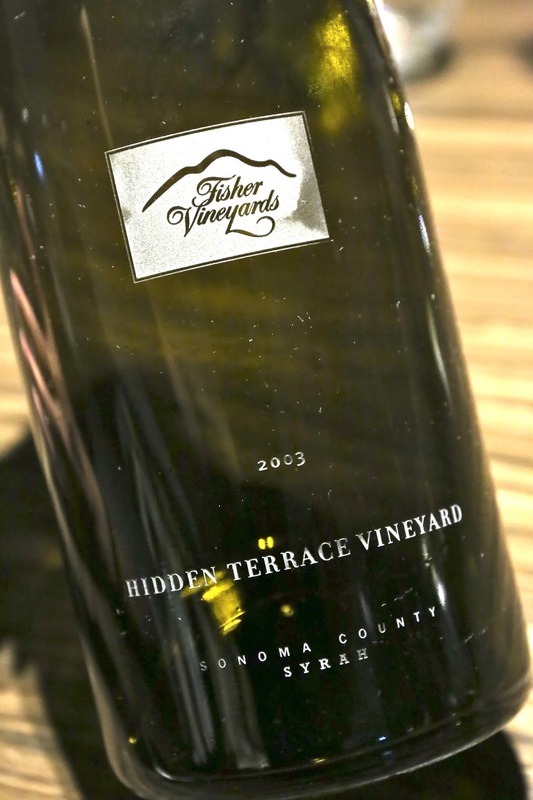 2003 Fisher Syrah Hidden Terrace Vineyard from magnum - my third magnum out of 4 I bought on my visit to Fisher, from a total of 400 magnums produced for this inaugural vintage. Much softer now, although still a little alcoholic on the palate. Very fragrant nose, showing woody, cedar nots, with a little mint, eucalyptus, and plenty of fruit. Sweet on the palate. Just shows the benefits of cellaring wine for them to develop.